It’s almost Sunday so the start of a new month as well as near the end of another weekend. 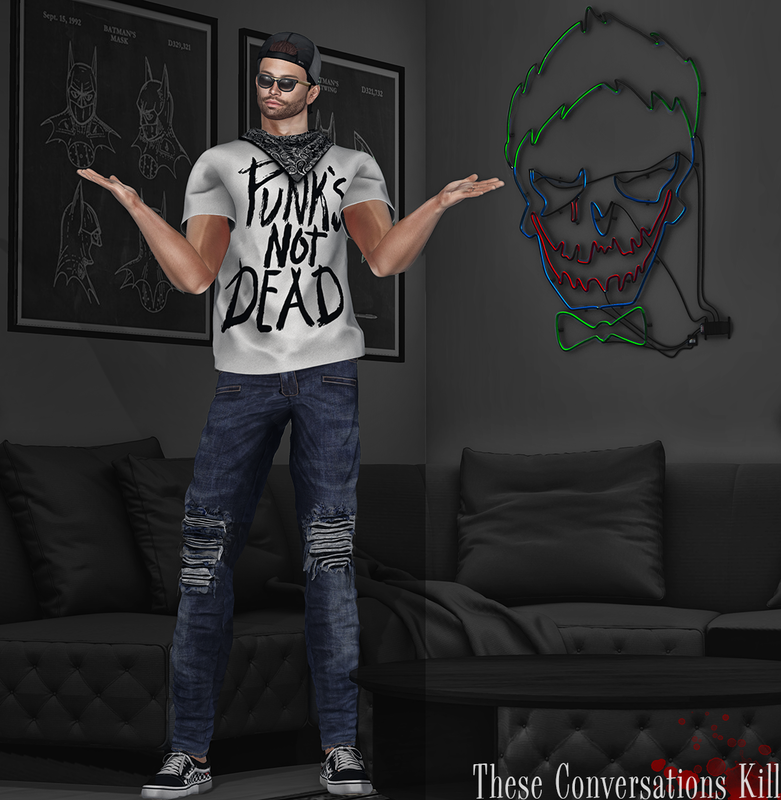 I’ve been sitting pretty good and coming up with some creative things to help feature some of the great clothing and items that have been coming my way lately. The one great thing is the second half of February’s events are just halfway through and the March events are starting to begin as well. The soundtrack for this post is a bit more mellow (not mello pun intended) but it’s a song that recently hit my radar that also features the outstanding young new talent, Khalid. Personally some of the words have meaning to me and I can relate to them and know of people personally that can also relate to them. That’s the best part about what I do as a blogger is I try my best to line things up with songs and hope I am able to translate it well from my photos. Image Essentials is set to release a new pose pack that will make it’s debut at the latest Designers Circle round that begins on March 5th. This set of poses is called 7 Deadly Sins and you guessed it, they are based off the cardinal vices in the teaching of the religion of Christianity. Many different mediums have portrayed these vices but none better then the 1995 film, Se7en with Brad Pitt and Morgan Freeman. There is a pose named after each sin (Envy, Lust, Gluttony, Greed, Pride, Sloth and Wrath) and include mirror poses so you are able to capture your best side. 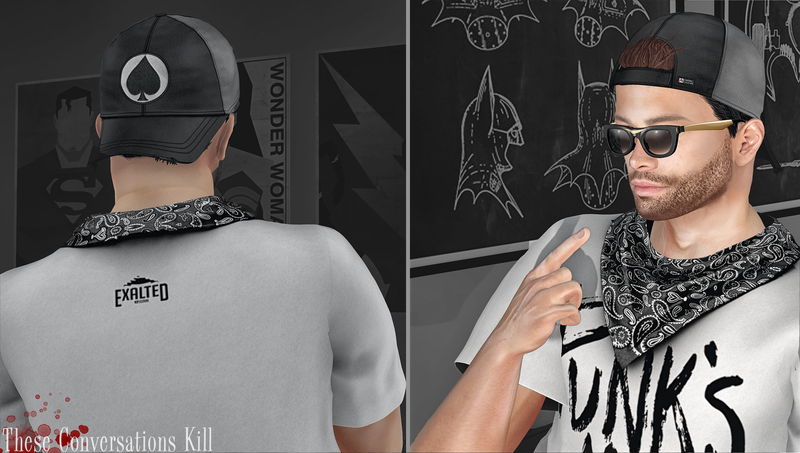 ExalteD has a really awesome urban shirt with a bandana around the neck available at D23 event (ending soon). 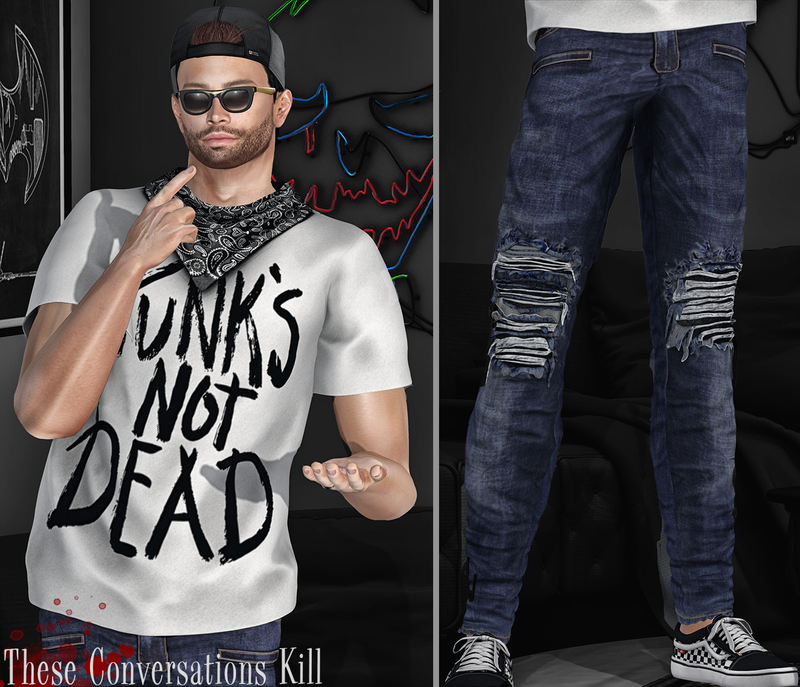 There are several colors of bandana you can choose from and get two different color shirts (black and white) in both solid and with the words “Punks Not Dead” written on the front and comes in sizes for Belleza and Signature male mesh bodies. I honestly love the detail of the shirt and the bandana, it is something I would definitely wear in the real world in the right weather conditions (hinting for spring to come sooner than later). Above you’ll see a closer look of the ExalteD shirt on the left side of the pic and on the left side you’ll see a better look at the “Distressed Jeans B.” by HEVO which is currently available at Men Only Monthly for their February/March round. While this brand is relatively new (or at least to me it is) I am finding I like the quality of the jeans and find myself wearing jeans with rips and holes in them. The package includes sizes for Belleza and Signature (Gianni) male mesh bodies. Even though I’ve previously blogged other versions of these shoes, I couldn’t help but pair these jeans with the FLI. Canvas sneakers (since I had not used the checkered version that made the most sense to me as I have kind of an urban skater look to me along with the hat that I’ll be getting to shortly.) When I say I really love low tops (and I’ve said it plenty) I really do mean it. While I might not have included it in the credits below, I feel like I’m going to be getting asked about the neon sign that’s in the background of some of the pics and I’ll let you in on where to get it since it was purchased on the Marketplace. It’s bey [REC] and is called Joker Neon v1 and can be purchased HERE if you like it enough to put it in your home/office/club wherever you might fancy. If there is anything I am big into fashion wise that isn’t low tops, it is hats (or caps in some parts of the world). Personally I have a huge collection of fitted ball caps of various different sporting teams and leagues and while it is harder to find awesome quality items like that here on the grid, I can thank the Ascend brand for making that more of a reality. The “Josh Baseball Cap” is everything I love about hats (the only thing that would have made it better is if it were fitted but then in this case you would get the tuft of hair coming out of the back of it (or if you have it flipped the front). With the option of being able to change the design on the front, it was only natural that I picked up the FATPACK as that is the only way to be able to do that (otherwise it is just one single design). There are a lot of cool different logos but I’ll give you a chance to go check it out for yourself. Plus with the included HUD you can change the front logo as well as the color of the panels on the cap, along with the hair color which you get 10 choices overall. With another simple but effective look I’ve managed to get another blog post in the books and I often feel that I’m long winded at times so I’ll get you to the part that gets you out shopping. I look forward to bringing you more great things such as items from FaMESHed and also The Arcade which is back for another new round.